If the thought of tequila takes you back to downing shots during Acapulco Spring Break (hello, 2005), it’s time to get educated in high quality, smooth tequilas. Enjoy tequila on the rocks, in a margarita or straight up at these NYC bars, specializing in this dangerously strong booze. 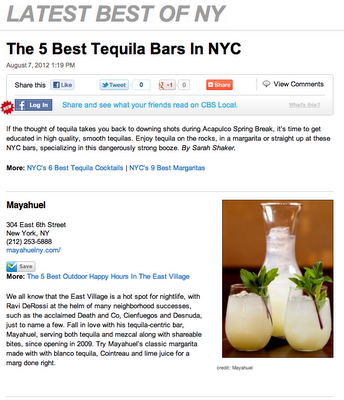 Thanks for share this great information for travelers, The 5 Best Tequila Bars In NYC, Wow I would like to go. I thinks that the best Tequila Bar in NYC is Gabriela's Mexican Restaurant and Tequila Bar this place is unique, you have to go.